Ajisainosato (アジサイの里) is the flower festival held by Kaiseimachi (開成町) on early June. There are more than 10,000 Ajisai (Hydrangea) in the town. At the festival, they have music ceremony, and food services. You can also buy Ajisai. Ajisai is very beautiful with rain. June in Japan is rainy season. So, if you had to cancel your schedule because of rain, visit Kaiseimachi to check out beautiful Ajisai. There is parking and restroom. At the festival, you can enjoy fresh food made in Kaiseimachi. Festival is early June, but you can enjoy Ajisai at the end of June. One of the best Ajisai Hanami spot in Kanto Area. The town is very quiet and peaceful. They have not only standard Ajisai, but also new kinds of Ajisai you can see. The town have research team to make new kinds of Ajisai. At the festival, you can find many local food and fresh vegetable and fish. Hydrangea (pronounced /haɪˈdreɪndʒ(i)ə/, common names Hydrangea and Hortensia) is a genus of about 70-75 species of flowering plants native to southern and eastern Asia (from Japan to China, the Himalaya and Indonesia) and North and South America. The flowers are extremely common in the Azores Islands of Portugal, particularly on Faial Island, which is known as the "blue island" due to the vast number of hydrangeas present on the island. By far the greatest species diversity is in eastern Asia, notably China and Japan. Most are shrubs 1-3 m tall, but some are small trees, and others lianas reaching up to 30 m by climbing up trees. They can be either deciduous or evergreen, though the widely cultivated temperate species are all deciduous. Hydrangea flowers are produced from early spring to late autumn; they grow in flowerheads (corymbs or panicles) at the ends of the stems. In many species, the flowerheads contain two types of flowers, small fertile flowers in the middle of the flowerhead, and large, sterile bract-like flowers in a ring around the edge of each flowerhead. Other species have all the flowers fertile and of the same size. In most species the flowers are white, but in some species (notably H. macrophylla), can be blue, red, pink, or purple. In these species the exact colour often depends on the pH of the soil; acidic soils produce blue flowers, neutral soils produce very pale cream petals, and alkaline soils results in pink or purple. Hydrangeas are one of very few plants that accumulate aluminium. Aluminium is released from acidic soils, and in some species, forms complexes in the hydrangea flower giving them their blue colour. 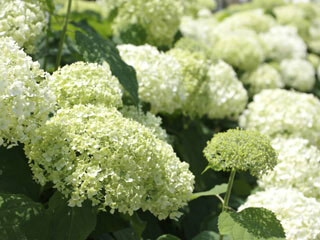 Species in the related genus Schizophragma, also in Hydrangeaceae, are also often known as hydrangeas. Schizophragma hydrangeoides and Hydrangea petiolaris are both commonly known as climbing hydrangeas.